Christchurch secondary school drama teacher Robert Gilbert has had a tortuous 12 months since his son Jaime, 22, was killed by falling masonry outside the Iconic Bar in Manchester St on February 22 last year. Jaime's birthday, his (Jaime’s) children's birthdays, Christmas and the Royal Commission hearing into the fatalities have been painful for Robert Gilbert. Robert’s seven year old son, Jackson, has been going to counselling. He has dyspraxia. One of the things he can't cope with is sudden change, which Christchurch has had a lot of. He idolised his big brother Jaime and he's desperately afraid he might lose another close family member. He seldom sleeps in his own bed. ``Jackson suffers terribly from anxiety. I have some quiet moments when I feel it's all too much to bear and the pain hits home. Mostly, I want to honour Jaime's death by focussing on a bright future - especially for his kids, Levi and India. 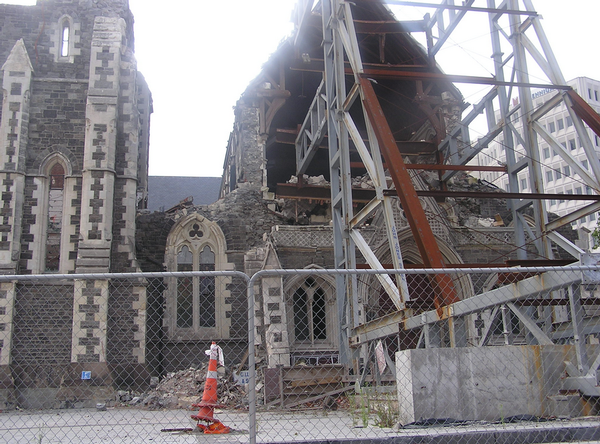 Christchurch is hard to love at the moment,’’ Robert Gilbert said today. ``There's dysfunctional leadership and so many people are living in such difficult circumstances. Some will be waiting years to have their homes repaired; others still don't know what will happen with their home or their neighbourhood. Many have lost their jobs or businesses. Many of the (February 22 victim’s) families went to Latimer Square yesterday (Eds: Feb 22, 2012) for the memorial service. Robert Gilbert said he cannot go past the Iconic Bar site without breaking down. ``I wonder if I ever will. The city is unrecognisable. It's very hard to process. So many landmarks have gone. There are still so many damaged buildings. Cafes - still with plates sitting on tables, where people abandoned their lunch that day; frozen in time. And our beloved cathedral utterly broken, gutted. We stopped at Cathedral Square yesterday. It’s eerie; awful. Our lives were changed forever on 22 February 2011. It is part of who we are now, and always will be,’’ the Rangi Ruru Girls’ School teacher said. Note: Jaime Robert McDowell Gilbert was running for his life from the bar he worked in when he became trapped under rubble. His workmates desperately dug through debris to save him but he did not survive.